Ah November, how I love and loathe you! Loathe since it signifies the end of Halloween, but love everything else about it, from the cooler, rainy weather to Thanksgiving feasts to the anticipation of the holiday season and the overall feeling of coziness. This November, I have been indulging in a lot of relaxation after a busy October. I've been taking time for self-care and really allowing myself time to unwind. So, the ten things I'm loving this month (check out past months' lists HERE) reflect how this month I've been taking time for me and pampering myself a bit! 1.) 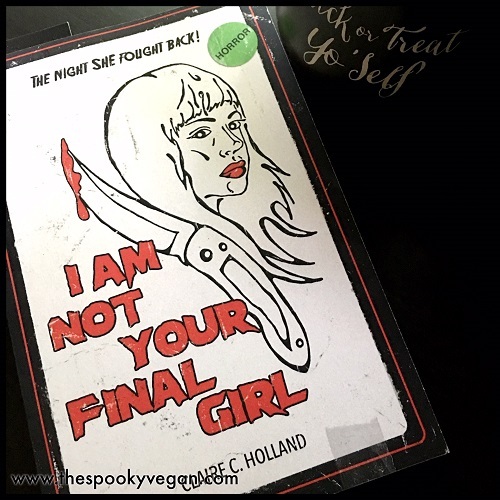 I Am Not Your Final Girl: Poems by Claire C. Holland - I picked up this collection of poems after seeing someone recommend it (thank you, whoever you are!) and absolutely fell in love! The short poems are all from the perspective of final girls from horror films and they are absolutely spot-on! 2.) Daiya Pumpkin Spice Pie - You better believe I stocked up on this delectable seasonal treat for Thanksgiving! It is so rich, creamy, with just the right amount of warming pumpkin spice. Mmmmmmmm! 3.) 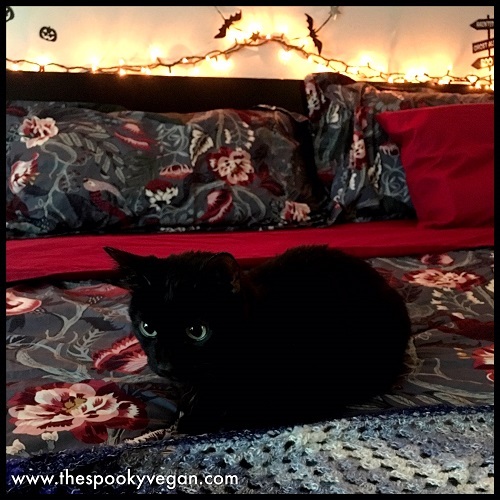 Ikea's Filodendron duvet cover - It's kinda silly how a new duvet cover can make me so happy, but this stunner did just that! There is something about the cooler temps that make me want to nest (ugh, as much as I hate that term), and this cozy, gorgeous duvet helped me refresh my bedroom. I paired it with red sheets and it is giving me all the refined holiday vibes. 4.) Pacifica Beauty Kale Lux Oil-Free Multi Cream - Since the weather is cooler and dryer, my skin is feeling the change and I need to up my moisturizing game. I love Pacifica's rich Kale Multi Cream - my skin just soaks it up and it doesn't leave any oily, greasy residue. 5.) 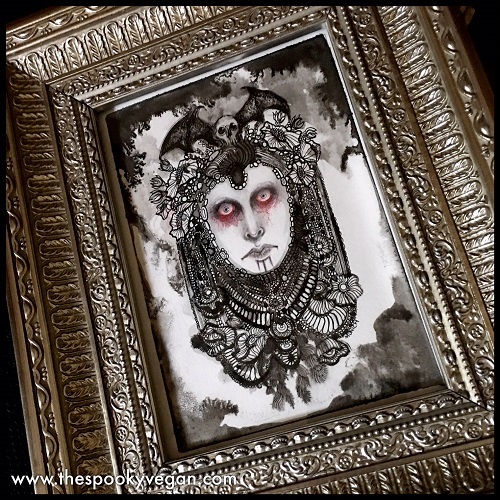 Portrait of a Vampire Bride by Becky Munich - How absolutely stunning is this piece?! I fell in love with it as soon as I saw it and was lucky enough to snag it and give it a loving home. I love all of Becky Munich's art, and this is the first original of hers I've been able to adopt. I could stare at it all day long, it has so many beautiful intricate details. 6.) Hocus Pocus and the All-New Sequel by A.W. Jantha - I finally got around to reading this Hocus Pocus book. It took me so long since I assumed this book would be a little corny or juvenile. However, it was a really fun read! The first half of the book re-tells the story of the Hocus Pocus movie (though it does add additional details that gave me a deeper appreciation of the characters), and the second part jumps ahead 25 years later to tell the story of Max and Allison's daughter Poppy, who must face the Sanderson Sisters again after accidentally resurrecting them. It is filled with fun characters, is entirely engaging, and is just a fun, breezy read! 7.) 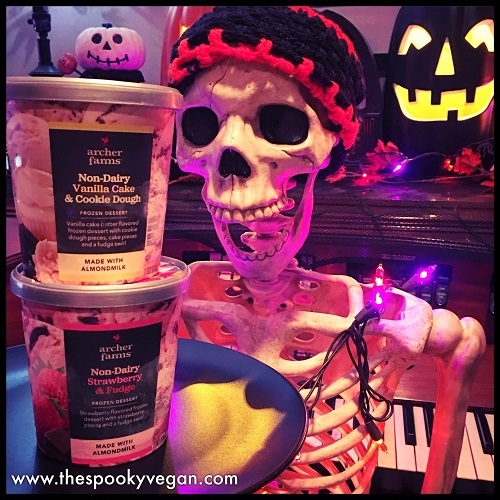 Target's new vegan ice cream - Target's in-house food brand Archer Farms released their own vegan ice cream flavors and they are insanely delicious! I can't wait to try the rest of the flavors, but I really loved the two shown above that I tried. The Vanilla Cake and Cookie Dough was so, so amazing! And I love everything strawberry, so the Strawberry and Fudge was so yummy and reminded me of chocolate-dipped strawberries! 8.) NCLA's Back to Black Nail Polish - I am always on the hunt for a black nail polish that is vegan, and I decided to give NCLA a try after hearing good things about this vegan brand. The nail polish goes on smooth, has full coverage after two coats, and has staying power. I found my new fave black nail polish! 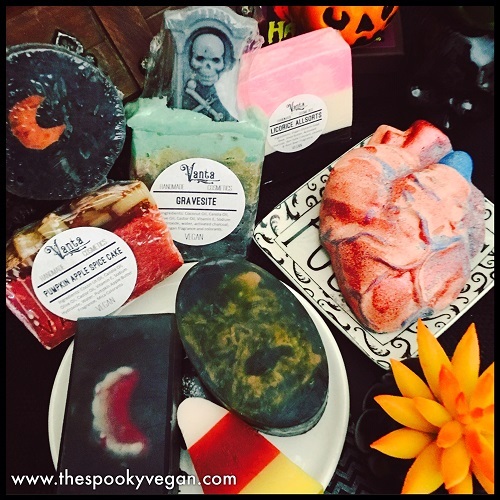 Look at all these incredible Vanta Vegan soaps, bath bombs, and more! 9.) Vanta Vegan Bath and Body - Look at this amazing assortment of vegan bath and body products! All of their handcrafted soaps and body products are gorgeous, smell incredible, and are made with cruelty-free, vegan ingredients. I absolutely love their Halloween and horror-themed items. 10.) Miyoko's Unlox Your Dreams - This vegan cream cheese spread finally hit my local Trader Joe's and I've been addicted to it ever since! It is amazing on an everything or onion bagel! It has a unique, tangy flavor that just pops in my mouth. 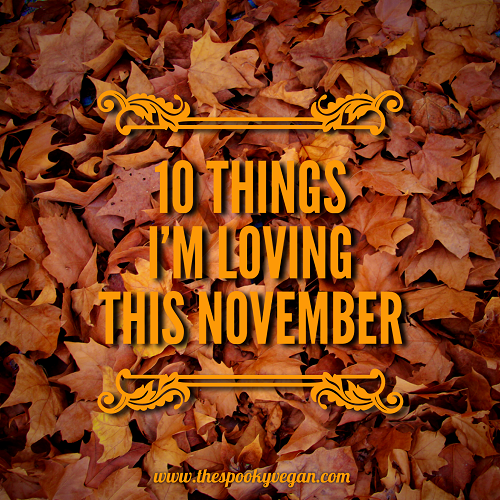 What have you been loving this November? Stay spooky, my fiends, and stay tuned for Creepmas starting on December 1st!